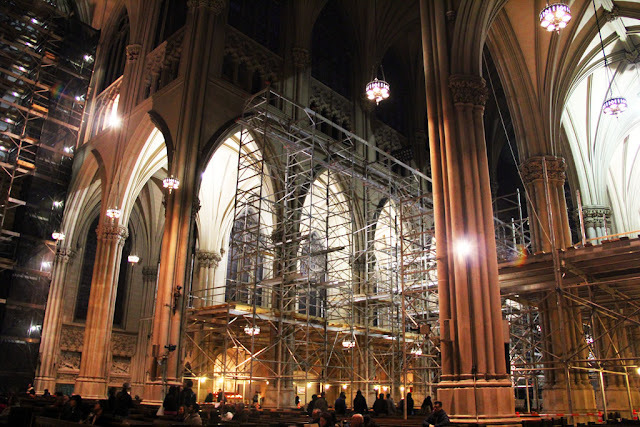 The currently-under-repair St. Patrick's Cathedral is I think the perfect metaphor for the state of the Church of late. 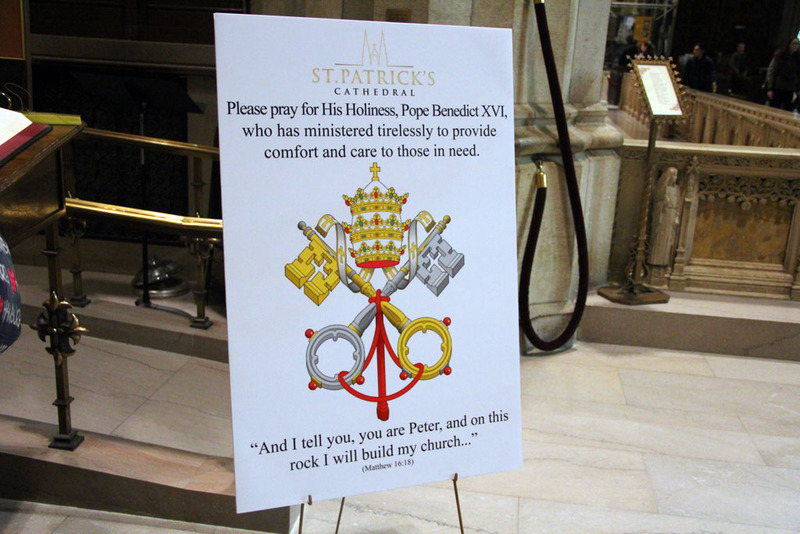 When I went to the cathedral the day I landed in New York, the new pope was only in his office for a about fortnight, trying to set the institution's affairs in order. But just as the church managed to withstood the test of time, the interior of the cathedral was just as awe-inspiring even when it was in a state of being repaired and in disarray in some places. 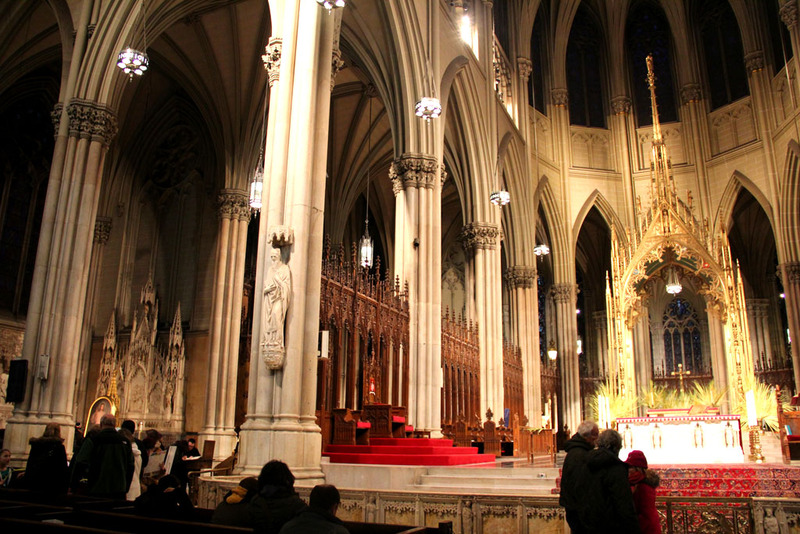 This actually was my first time to see the interior of St. Patrick's Cathedral. I visited it in 2010 and again a year after, but the church was closed for some exterior work. I was in a bit of luck that they opened the church, as it was a day before Palm Sunday when I visited. 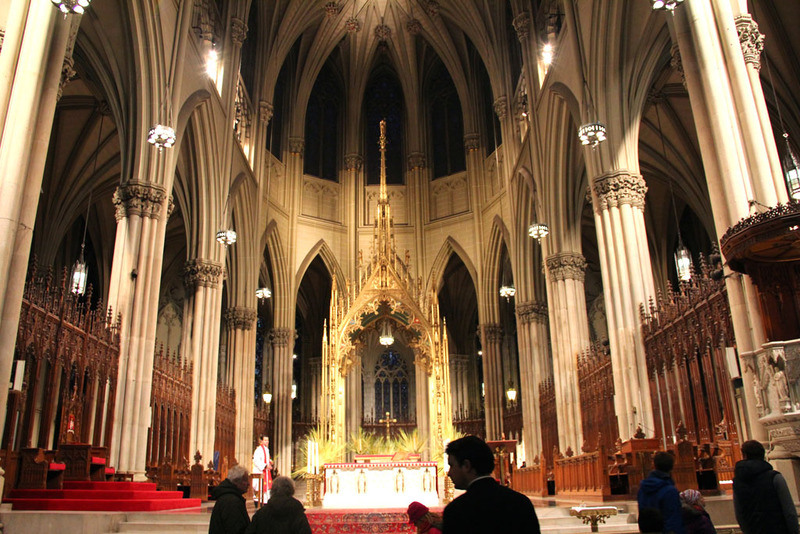 The cathedral is the seat of the Archdiocese of New York. It took twenty years to build the cathedral, from 1858, when the first cornerstone was laid, to 1878. The construction was interrupted for about five years by the Civil War. It was dedicated in 1879 . The 330-foot spires were added ten years after the church was built. 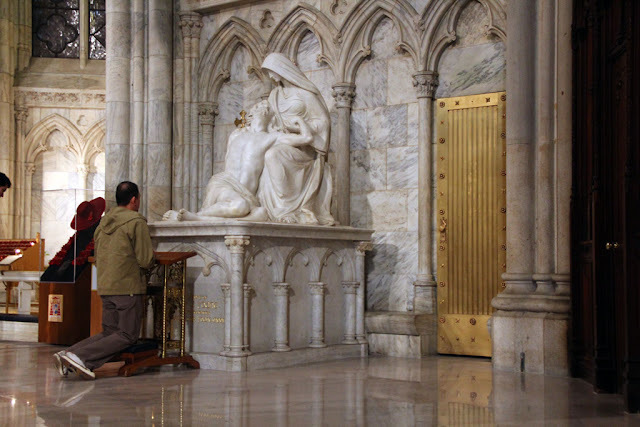 The cathedral was designed in a Gothic revival style, constructed using Tuckahoe marble. The Gothic character of the building was very apparent on the rib vaults dominating the ceiling, which emphasizes the verticality of the architecture. The sanctuary. The archbishop's chair is on the left side, on the red podium. The church was laid in a cruciform plan, with the nave running from west, the location of the entrance and the narthex, to east, where the sanctuary is located. 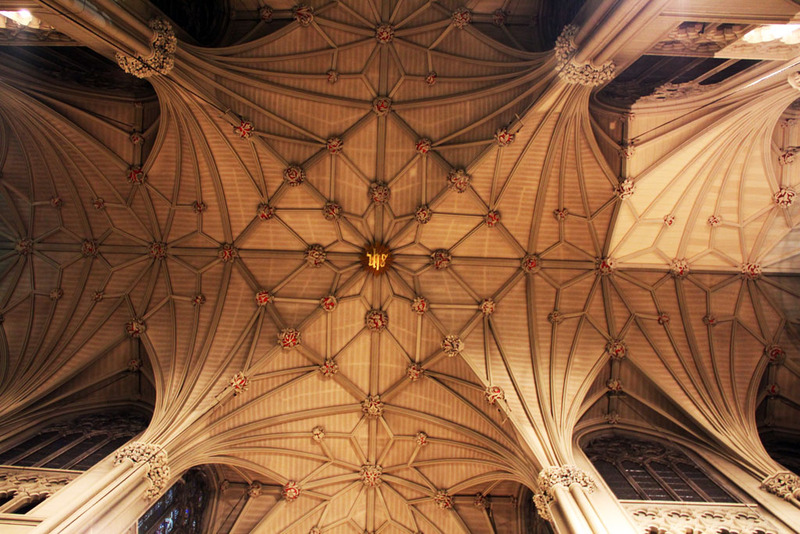 It is intersected by the north and south transept, which also has an entrance for each side . A large portion of the church is covered with scaffolding, and sections of the floor were laid out with plywood because of the repairs. As I mentioned, it was the day before Palm Sunday, and I noticed that preparations are being made in the church for the next day's festivities, such as several tables laden with palm fronds. Despite the disordered state, the church was full of people when I came in, which was already early evening. Many of those who came inside were tourists, but the majority came to worship. Even in the midst of the commotion, I can still feel the solemnity of the place. I found a place near the front to sit down and offer prayers. Candle offering. A million candles are lit here every year. After praying I walked around the church to see the rest of the building. I circled the ambulatory, and I noticed several chapels and altars built along the niches. 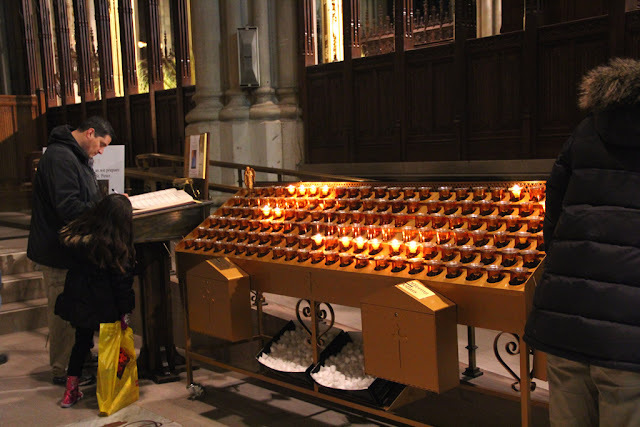 I stopped in some of the altars, offering candles for my intentions. The altars themselves were works of art. The altar of St. Louis and St. Michael were made by Tiffany & Co. Paolo Medici designed the St. Elizabeth altar, while Dominic Borgia did the one for St. John Baptist de la Lasalle. 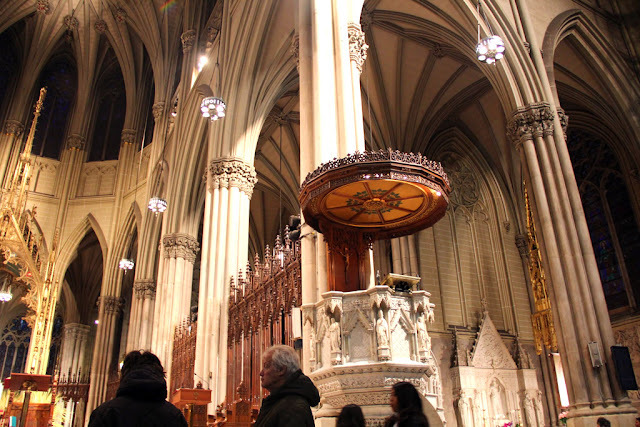 Even the stained glass windows and the 26-foot rose window were made by artisans. The sky was already dark when I left. I purposely stayed longer as I know that I won't be able to join a Sunday service the next day as I would be traveling to Boston. 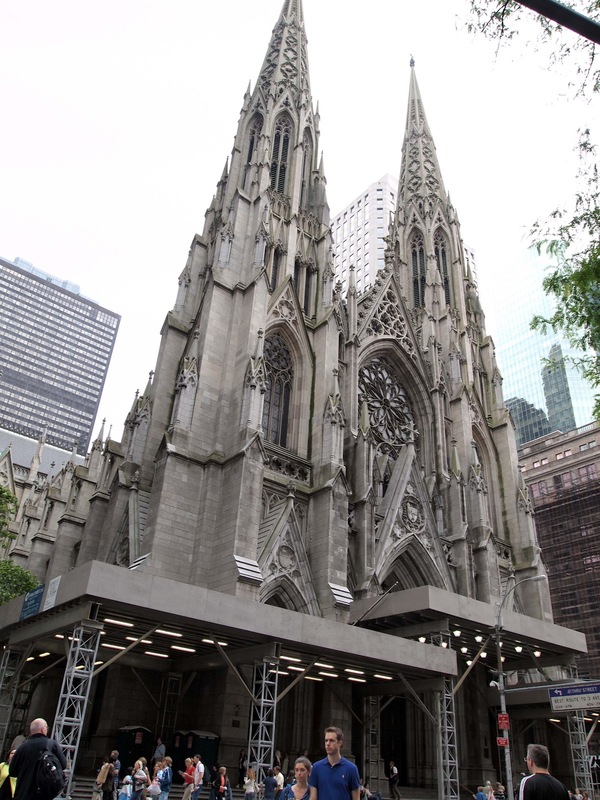 Exterior of St. Patrick's Cathedral. Taken in 2010. The cathedral is located in Fifth Avenue, in Manhattan, between 50th and 51st Street. It is just across Rockefeller Center. Lovely architecture! Reminds me of the churches I saw in Europe. Unfortunately a lot of those churches there are just museums now or tourist spots. No Masses are held anymore.